Overcoming autism is like trying to escape an octopus’s clutch: Just when you feel free from one tentacle, another swoops in to take hold. Martin had a terrific spring, and his digestion and health seem better than ever. Yeast has been under control for a year. Bowel movements are formed and firm. He sleeps. His height and weight are right where they’re supposed to be. His once-distended belly lies flat. We’ve wrested him from several tentacles. Until recently, Martin has never had overt trouble with allergies. The first sign of a change was a few months ago, at a diner. (Martin ordered an Angus beef patty, no bun, and steamed broccoli. The catsup he ate was not organic. It was full of crap.) Midway through the meal, Martin started sneezing and rubbing his eyes. His face became red, his nose ran, his eyes puffed and watered. I had no idea what was going on. I did my best to dab at his eyes with a damp napkin and make him comfortable. The reaction faded as we drove home, 20 minutes later. A couple months passed without another incident. Then, in July, he had three such reactions in one week: two when he got home after school (Martin attends summer school), and one over breakfast. I don’t know if something in our house might be bothering him, something that coincidentally was also at the diner. I did notice that, with all three reactions at home, he was drinking camel milk when the trouble started. Accordingly, I’ve suspended camel milk until we figure this out. No more reactions of that type—runny nose, puffy eyes—have occurred. Meanwhile, however, red spots have appeared on Martin’s left temple. They showed up two or three weeks ago, faded, and reappeared more prominently this weekend. And they’re breeding: When the spots emerged a few weeks ago, they were four. 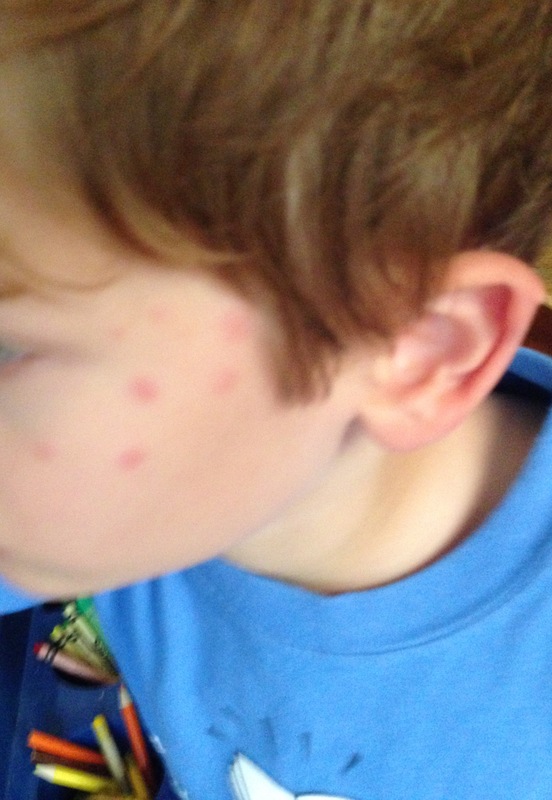 This past weekend, they were seven on his face and one on the back of his neck. The spots are neither raised nor itchy. They are not bug bites. Terrible photography. Sorry. He didn’t want to be still. So what the hell are they? Allergies? To what? Are they the result of a Heilkunst clear? Our last clear was PCV7. The skin is the body’s largest drainage organ. Or are the spots from clearing something else? We’re working on Martin’s biofilm now, plus the possibility (awaiting test results) of chronic Lyme, both of which involve antimicrobial drops. Is his body responding with spotty face? Also happening nowadays: Martin’s ears hurt, and he’s coughing at night. His emotional regulation is terrible. He seems out of it. Where do those facts fit in the puzzle? I’ve scheduled new allergy testing with Martin’s pediatrician, and I’m corresponding with our other practitioners, trying to figure this out, which leads to the biggest mystery of all: When exactly did I become qualified to make sense of such things? I’ve never wanted to fight an octopus. This entry was posted in Nuts and Bolts and tagged allergies, asd.recovery, autism, heilkunst, lyme by findingmykid. Bookmark the permalink. Could it be sunscreen? The dots look like that could be it. Good luck! They fluctuated for a while and have not been back in several weeks, during which I’ve used sunscreen on him. So—still wondering!